PENCILLER: Gabriel Hernandez Walta. Cover by Mike Del Mundo. Well done. Seriously. This series is a masterpiece. A perfect masterpiece? Maybe. That depends on a lot of things, not the least of which is the reader’s personal taste. But you’d have to do a lot to convince me this isn’t a master class in comic book storytelling, and a high point in the Vision’s near 50 year history. This final issue of The Vision sees our titular character finally face the reality of what his wife Virginia has done, and what his dream of having a family has become. We also get a look at how these events shape Vision, and what remains of that family, going forward. What has fueled this whole story has been Vision’s motivation to be human. As he flat out said to Scarlet Witch last issue, “I want to be like everyone else.” Therein is the underlying tragedy of this whole thing. He wants it so badly, but he can never truly have it. That’s why there’s such a a morbid irony what Vision does when he finds out his wife has, for all intents and purposes, poisoned herself. He tells Virginia to use her powers to phase the substance out of her, and that he’ll use his status as an Avenger to correct the murder confession she gave to the authorities. He wants to reap the benefits of his family’s super powers, and his status as an Avenger to save this illusion of normalcy he’s created for himself. He’s trying to have his cake and eat it too. That’s what he’s been trying to do this whole time. And of course, life doesn’t allow for that. But Virginia sacrifices herself to save Vision out of love for their family. And as we see in the flashbacks, she modified his memories to protect him. 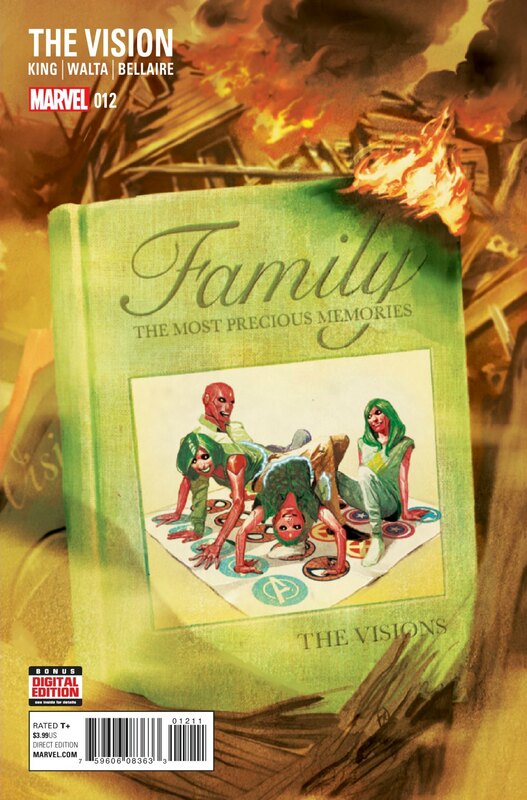 As tragic as it all is, it illustrates that Vision was able to create a loving family for himself, only to have it taken away from him. I imagine this is part of the reason why this series has resonated so well with readers. These characters aren’t looking for something so firmly planted in the realm of fantasy, or even overtly selfish. They’re looking for love and acceptance, as well all are. We see/hear Virginia’s confession to the police over the course of three pages, which Jordie Bellaire colors in a blaze of yellows, oranges, and reds (shown below). It’s a cool effect, though I’m happy we only see it for a limited time. It’s tough on the eyes after awhile. Bellaire may be the unsung hero of this book. The muted palette she’s used for this series has worked wonders. I had seen Gabriel Hernandez Walta’s work prior to The Vision. He did some fine work on Magneto, and I have a miniseries he did for IDW called The Suicide Forest. But The Vision made him a star. At least in my book. His rendering of the family is very human and familiar, but at the same time distinctly and hauntingly different. In this final issue, he’s at his strongest during Vision and Virginia’s final scene together. Some of it’s in the very subtle nuances of a facial expression. At other points its more blatant, i.e. 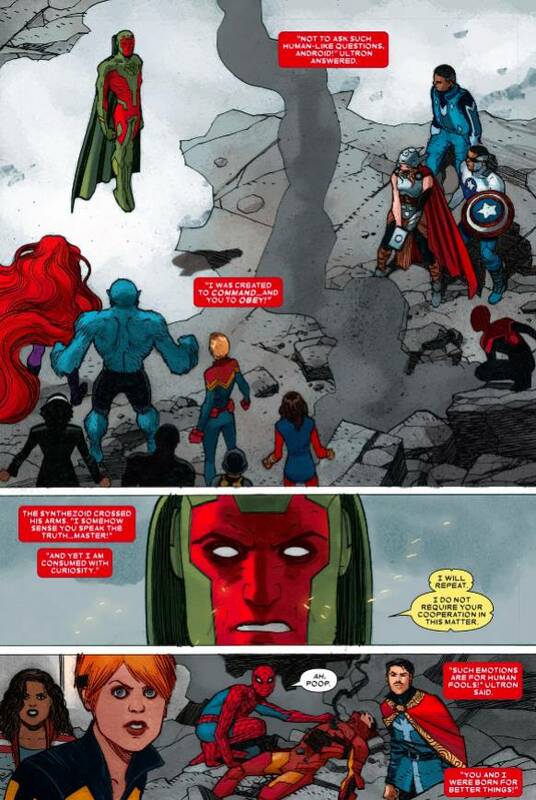 the panel where we see tears on Vision’s face. It’s a scene that grabs you and doesn’t let go, even after you’ve closed the issue. The lone element in this series that left me unsatisfied was the role Scarlet Witch played. In issue #7, we see that she incited all of this. Not just by giving Vision her brainwave patterns, but her relationship to Vision as a whole. I had hoped to see a bigger emotional pay off between Wanda and Vision. She has a scene with Viv in this issue, where we see there’s something of a motherly bond between the two. That’s another ball of wax entirely. I have mixed feelings about Viv’s survival, and her continued appearances in books like Champions. Especially with Tom King not at Marvel anymore. What he, Walta, and this team created is so unique, with a vibe and tone unlike anything else at Marvel right now. I almost wish we could let this remain a crystalized masterpiece for awhile before thrusting Viv into the Marvel Universe at large. But of course, that’s not how mainstream superhero comics work. In the end, everyone at The Vision has done something few creators at DC and Marvel get to do. They opened a new door for storytelling that other creators can now walk through and explore. In the process, they added a new dimension to a long-standing, yet often under appreciated piece of the Marvel lore. So I’ll say it again: Well done, folks. You made great comics. This entry was posted in Comic Books/Graphic Novels and tagged comic book reviews, comic books, Gabriel Hernandez Walta, Jon Stewart, Jordie Bellaire, Marvel, Marvel Comics, Mike Del Mundo, Rob Siebert, Scarlet Witch, single issue reviews, The Daily Show with Jon Stewart, The Vision, The Vision #12 (2016), Tom King, Viv Vision, Wanda Maximoff on 11/02/2016 by primaryignition. As amazing as this series has been, and as much of a landmark as its been for the Vision, ending it next month is the right move. This story feels like it has a distinct beginning, middle, and end. Better they not try to forcibly extend it, especially now that Tom King is exclusive to DC. 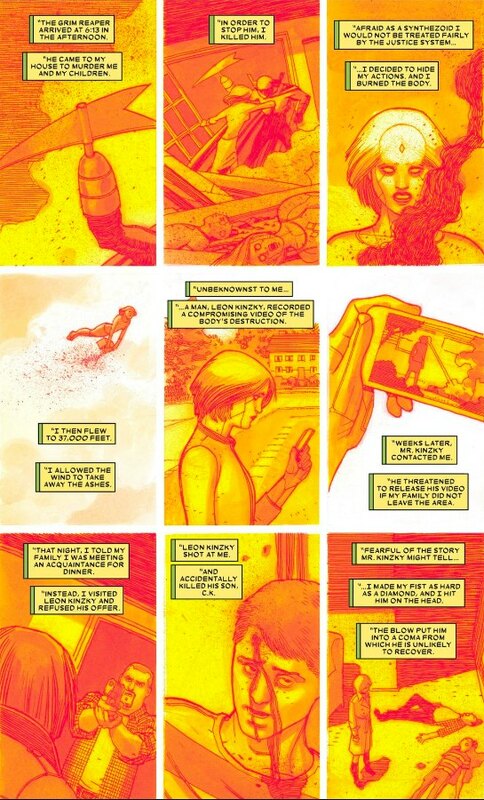 The Vision has an appreciation for the character’s history that does tremendous things for this story’s depth. Case in point, the caption boxes in this issue take us back to Vision’s origin, plucking actual dialogue written by Roy Thomas in 1968. We’re reminded of how he came to be, and that ironically his original purpose was to kill the Avengers. We read Utrom’s first words to him, and later his first words to his wife Viv, reminding us he’s come full circle. King is working with Vision’s history, and using it to support his story. Writers don’t always take that route, and I credit King for doing his homework. The series has been building to this fight with the heroes since issue #1, and it doesn’t disappoint. It gives our heroes a painful reminder: If the Vision goes bad, they’re in big trouble. He disposes of some of Marvel’s big guns with unsettling ease. It’s not epic or event-comic worthy, but Walta and colorist Jordie Bellaire give us something satisfying that still fits with the tone they’ve set. Also, seeing Bellaire color all these flamboyantly dressed heroes is a thrill, considering we’re used to seeing a more subdued palette from this book. There’s also a certain gritty texture to Walta’s art that accentuates the grim undercurrent in this series. It’s especially powerful in quiet scenes, like the one we see here with Virginia and Viv. 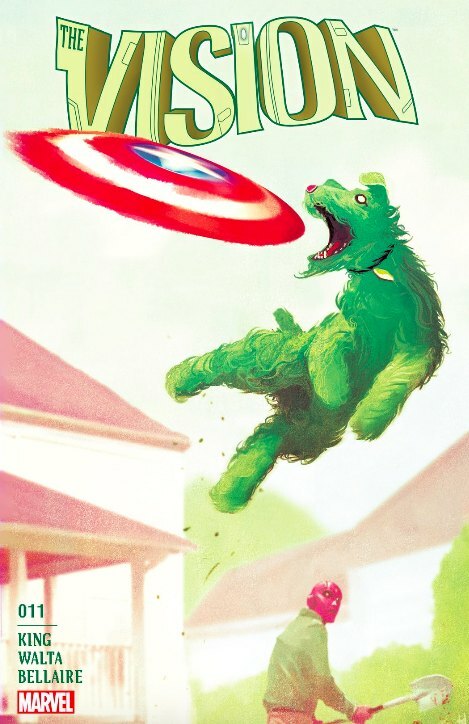 There’s a heart-wrenching scene where the Vision family dog exits the series that’s almost too good. Human-on-animal violence is risky territory, even if the subjects in question are robots. 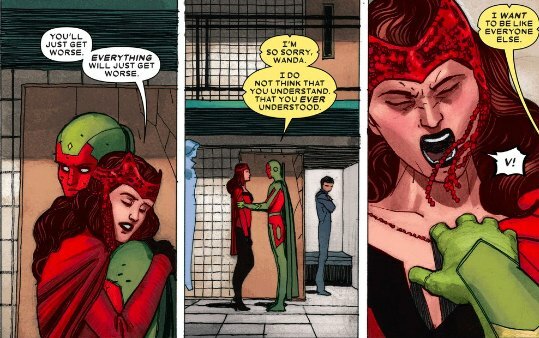 Another moment the series has built to is Vision’s reunion with Scarlet Witch. This felt like it should have been a fight. Vision tries to burn the world to the ground, and the only one standing in his way is the woman that inspired him to create a family in the first place. Instead, Wanda just says some stuff about understanding him, and how he won’t be able to come back from this. That’s all well and good. But that’s it? I’m hopeful this was just an appetizer, and a more physical confrontation will come next issue. Of all things, this reminds me of the talk show scene in Edward Scissorhands. Edward makes a comment about wanting to meet a corrective surgeon, and a pair of ladies in the audience can’t understand why he wouldn’t want to be “special” anymore. The whole “burden of being different” thing obviously works for this book. This entry was posted in Comic Books/Graphic Novels and tagged comic book reviews, comic books, Edward Scissorhands, Gabriel Hernandez Walta, Jordie Bellaire, Marvel, Mike Del Mundo, Rob Siebert, Roy Thomas, Scarlet Witch, single issue reviews, Spider-Man, superheroes, The Vision, The Vision #11 (2016), Tom King, Wanda Maximoff on 09/29/2016 by primaryignition. PENCILLERS: Michael Walsh. Cover by Mike Del Mundo. 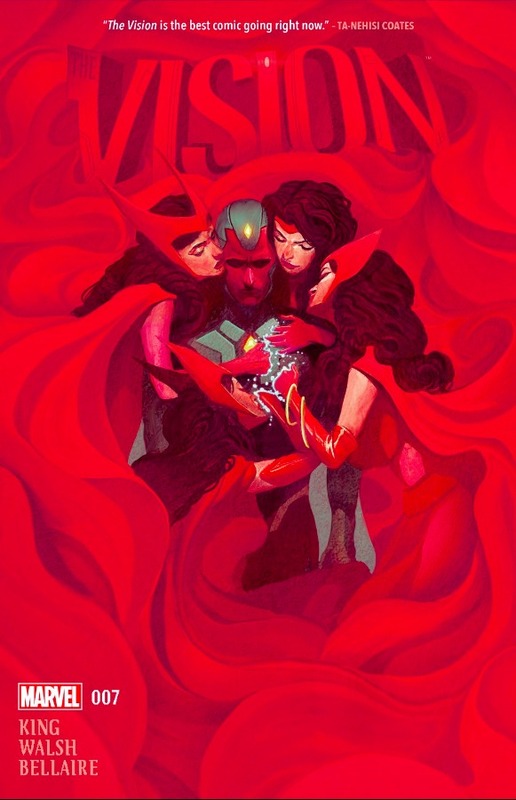 Tom King, author of The Vision, said not long ago that the title character’s relationship with Scarlet Witch has haunted this whole series so far. 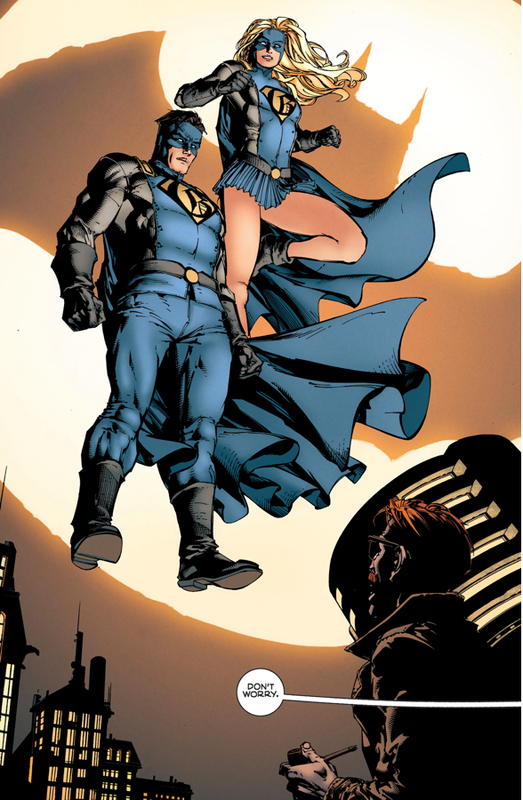 To me, she’s as big a character in this as anyone in the family…” In this issue we finally find out why that is. In a development that shouldn’t necessarily come as a surprise to those familiar with Vision’s history, issue #7 lets us know that he created his robotic wife Virginia using the brain patterns of Wanda Maximoff, a.k.a. Scarlet Witch. We also look back at some of the pivotal moments in their romance, and how Vision came to be in possession of Wanda’s brainwave patterns. It’s actually surprising how simple it turns out to be. We knew Wanda was going to play a role in this series at some point. When they revealed how Vision created his wife and family, there was really no other option, was there? It had to be her. Who else could it have been? Her appearance was inevitable. Thankfully, it doesn’t disappoint. We spend virtually the entire issue going over select moments in Vision and Wanda’s history. We see part of their first night in bed together (left), we see them at home, we see them argue, we see their family life, and we see the awful consequences of Vision losing his memory in Vision Quest. Toward the end, we also see what seems to be a reconciliation, and just how pivotal Wanda was to Vision’s attempt at the American Dream. There’s some great plot symmetry with how King involves Wonder Man in all of this. This issue is a prime example of how continuity can be used to bring depth to a story, so long as one doesn’t rely too heavily on it. In King’s case, he uses it as Vision’s motive. It also adds a hell of a lot of depth to the eventual confrontation between the two. Gabriel Hernandez Walta has the issue off, and he’s definitely missed. To be fair, his style isn’t that different from what guest artist Michael Walsh gives us here. The main difference is Walsh is a bit smudgier than Walta. But it’s not a drastic change. The biggest complaint I can throw at this issue from an artistic stand point is there’s a word balloon with its tail going the wrong way. 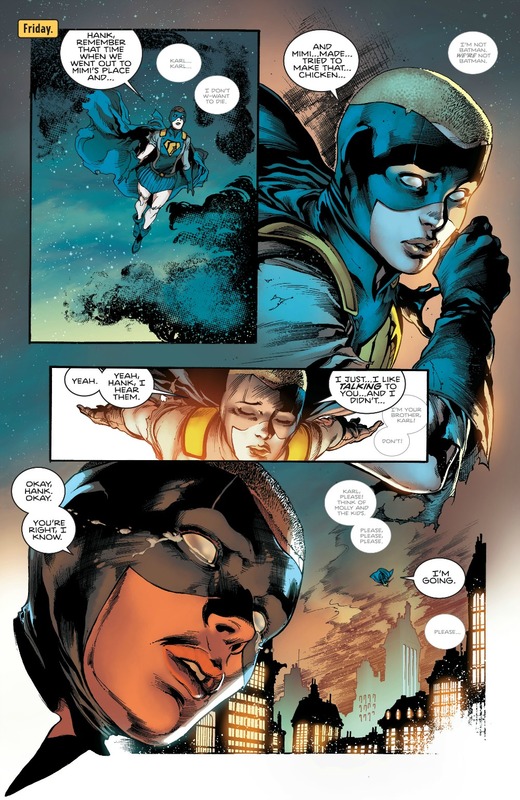 Colorist Jordan Bellaire is back on this issue, and definitely helps ease the transition. Thankfully, Walta will be back next month. The only moment in this issue that stands out as awkward is when we peek in on a past battle between The Avengers and Count Nefaria. They’re literally making out behind a tree during the fight (shown right). I”m not sure I would have framed the scene this way. At one point, we literally see a car thrown against the side of a building. It seems like it’d be more logical to see one tending to another, using a strewn about vehicle for cover. At the very least, I’d have made that tree a bit bigger. It’s like…HEY! We see you! EVERYBODY can see you! This entry was posted in Comic Books/Graphic Novels and tagged Avengers West Coast: Vision Quest, comic book reviews, female superheroes, Gabriel Hernandez Walta, Jordan Bellaire, Marvel, Michael Walsh, Mike Del Mundo, Rob Siebert, Scarlet Witch, single issue reviews, superhero comics, superheroes, The Avengers, The Vision, The Vision #7 (2016), Tom King, Wonder Man on 05/18/2016 by primaryignition. 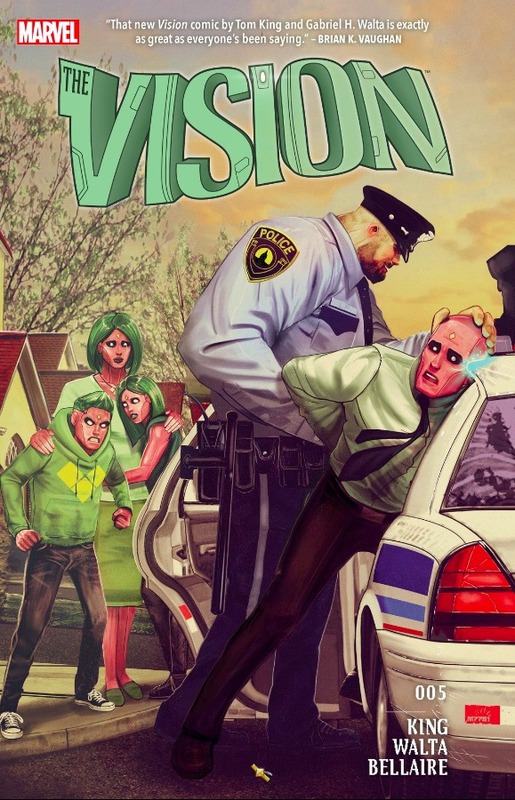 A Review of The Vision #6 – The Jig is Up! PENCILLER: Gabriel Hernandez Walta. Cover by Marco D’Alfonso. This series needs to get cancelled…in seven months. 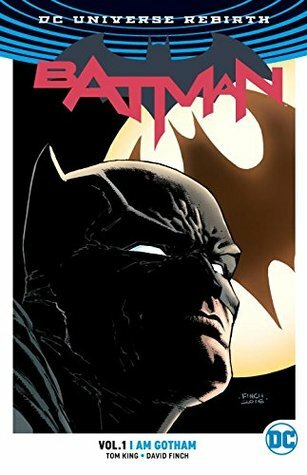 Tom King has signed an exclusive deal with DC, and will succeed Scott Snyder as the writer on Batman. But we’ll be seeing his handprints on The Vision through issue #12. That should really be the end of this series, as you’re not going to find anyone who’s going to top this, or even maintain the current quality. Plus, let’s be honest. 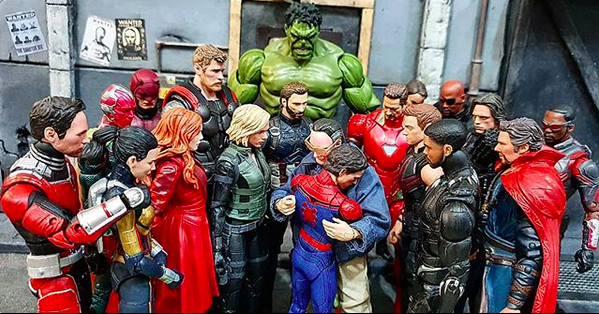 This is Marvel. If there’s enough demand, another Vision series will be part of their next big relaunch. The jig is up for The Vision’s wife, Viv. Her husband has learned her secrets. Vision literally discovers Grim Reaper’s body buried in the back yard. The question now is, what happens going forward? Does The Vision maintain this classic American facade he’s created? Or is it all for naught now that the bodies are piling up? 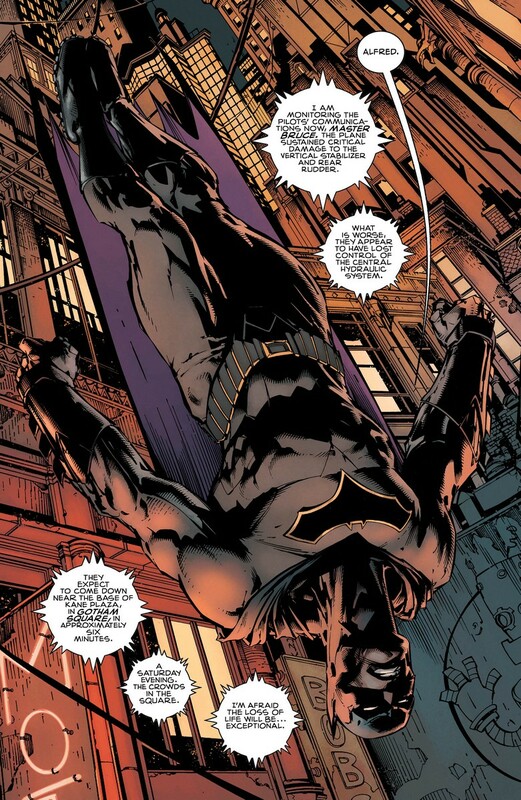 King and Gabriel Hernandez Walta aren’t going to earn any points with the PETA crowd on this issue, as Grim Reaper’s body is discovered by a small dog, which is subsequently killed. It’s a jarring image, but that’s part of this book’s M.O. isn’t it? Speaking of which, how about this headshot? It’s not even the blood. That’s just the garnish on the dish. It’s the eyes, the color of the “skin,” and the way the shadow frames his face. This page puts you inside the issue, and face to face with The Vision. As such, it puts you in the shoes of all the citizens who interact with he and his family. And yet, it’s not as though Vision is cast as this awful horror comic villain. In some ways, he’s very sympathetic here. He wants to be normal. He wants a family, and he’s willing to go to drastic measures to make that a reality. But of course, he was doomed to fail from the start. And if anyone finds out about those drastic measures, his entire existence is ruined. It looks like next issue we’re officially acknowledging the elephant that’s been in the room this whole time: Wanda Maximoff, a.k.a. Scarlet Witch. We’ve had a good six issues to dive into Vision’s new status quo, and now is a good time to peek behind the curtain and see just how we got here. Wanda had some sort of role, most likely unknowing, in the creation of this family. I’m curious to see if that role is as unsettling, or perhaps as horrific, as what has subsequently unfolded. 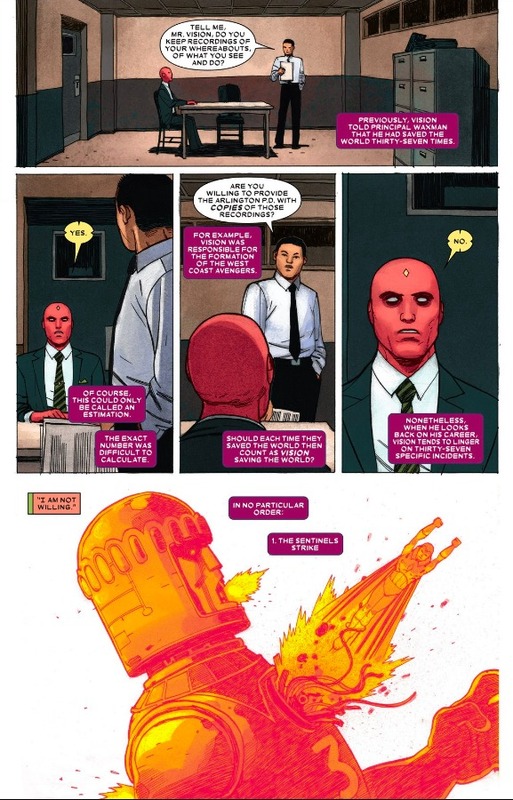 This entry was posted in Comic Books/Graphic Novels and tagged comic book reviews, comic books, Gabriel Hernandez Walta, Grim Reaper (Marvel), horror comics, Marco D'Alfonso, Marvel, Rob Siebert, Scarlet Witch, single issue reviews, superhero comics, superheroes, The Vision, The Vision #6 (2016), Tom King, Wanda Maximoff on 04/13/2016 by primaryignition. 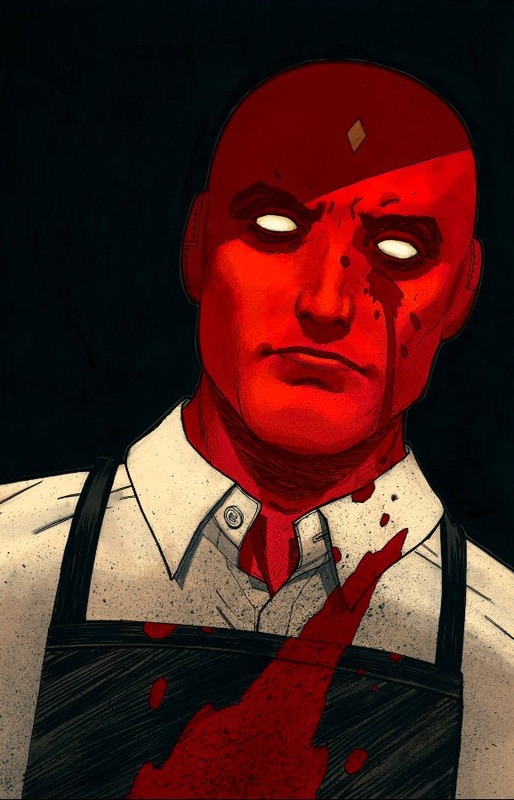 A Review of The Vision #5 – A Fall From Grace? ***Need to catch up? Head back to the beginning with The Vision #1. I was bummed to hear Tom King signed an exclusive deal with DC. Yes, he’ll be staying on through issue #12, and allegedly finishing the story he began. And I suppose there’s something to be said for not overstaying your welcome. But The Vision is arguably the best book being put out between Marvel and DC right now. There’s an interesting parallel in this issue between the Vision and politicians/celebrities who’ve had a public fall from grace. Earlier in the series, Vision had a line about saving the world 37 times. There’s a great sequence in this issue where he recounts each one of them, knowing that no matter how many times he’s saved the Earth, being associated with this murder would still leave him irredeemable. I read that, and I immediately thought of people like Richard Nixon, John Edwards, Elliot Spitzer, etc. Granted none of them saved the world, but they were all public servants who fell from grace. So in that sense, King provides us with a bit of insight into modern society. Not many superhero comics start off quoting Shakespeare. But King does it here with a passage from The Merchant of Venice. It’s Shylock’s famous “If you prick us, do we not bleed?” speech about Jewish people. It’s…a choice. It’s a bit of an uncomfortable one at first, but I suppose that’s part of what he’s going for. And it works, so it’s fair enough. King and Walta up the creep factor in the scene where the police detective approaches the house (below). 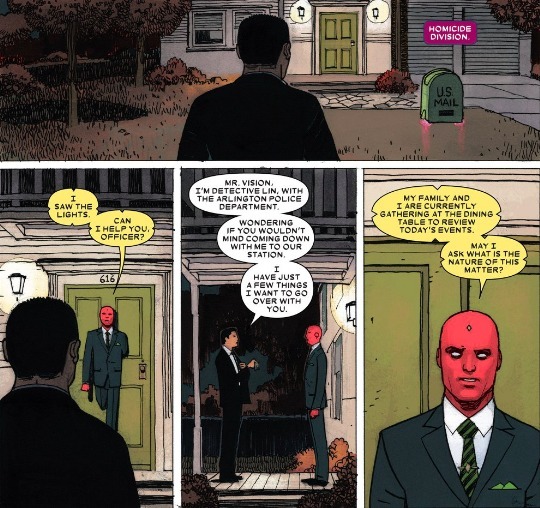 Vision, in a suit no less, simply phases through the door, having seen his visitor approaching. Moments later, Virginia pokes her upper body through the door to check on them. It’s something so simple, but it’s a striking reminder that this family is so very different from the humans they interact with. 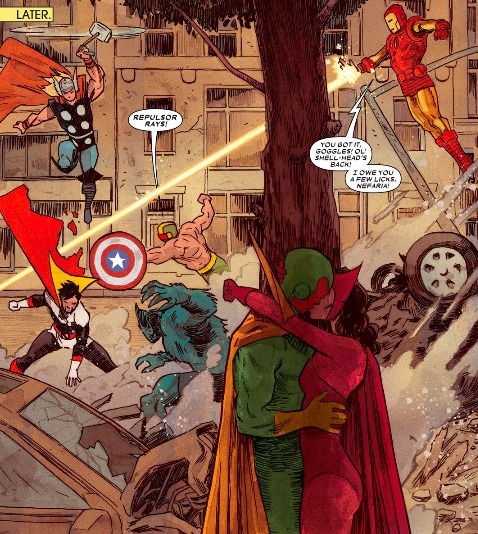 Also, the way Vision simply refers to Virginia as “wife” is unsettling. Gents, don’t try that at home. The wheels continue gradually come off Vision’s attempt at a normal family life. Guilt continues to peck away at Virginia’s cybernetic psyche, and the teens are being hit with a variety of emotions. And as the cover for next issue has their house ablaze, I’d say things are going to get worse before they get better. 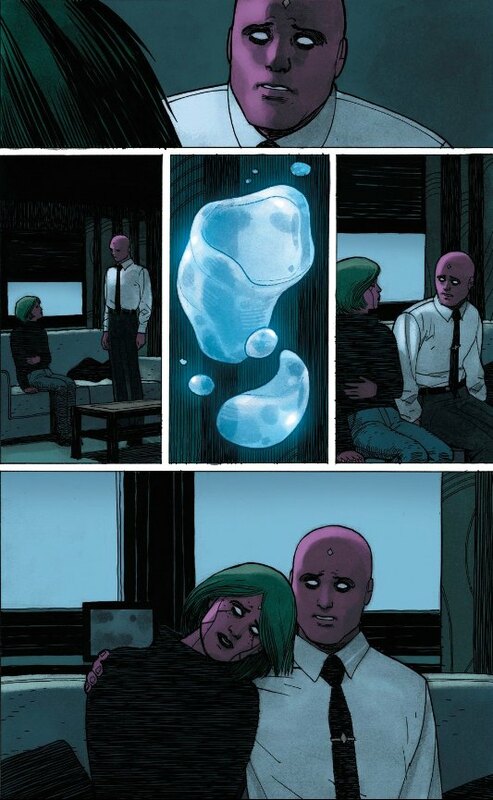 This entry was posted in Comic Books/Graphic Novels and tagged comic book reviews, DC Comics, Gabriel Hernandez Walta, Marco D'Alfonso, Marvel, Rob Siebert, Scarlet Witch, single issue reviews, The Merchant of Venice, The Vision, The Vision #5 (2016), Tom King, Wanda Maximoff, William Shakespeare on 03/14/2016 by primaryignition.